Along with several other Google products, Blogger’s taken on a whole new look: A clean, sleek interface designed for a streamlined blogging experience. Not only does the new interface load faster, but we’ve also added shortcuts to your most important blogging actions. Check out our quick list of what’s changed below. Writing a new post: Just click on the orange Pencil icon on your Dashboard to access the Post Editor. Viewing your posts: The gray Post List icon will take you to a list of your published and drafted posts for a specific blog. Catching up on your favorite blogs: Below the list of your own blogs, you’ll see a list of the blogs you follow with an excerpt from their latest posts. 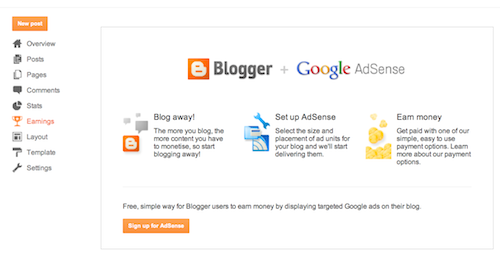 Note that the Earnings tab will only show if AdSense supports your language. 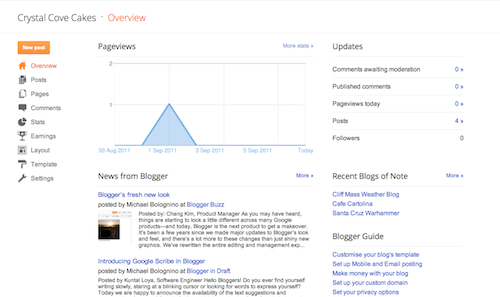 On the Overview tab, you can see your blog’s activity, news and tips from the Blogger team, and recent Blogs of Note. To write a new post, just click on the orange Pencil icon from your Dashboard, next to the blog you want to post on. You’ll find the Publish, Save, Preview, and Close options at the top, and post options such as Labels and Schedules along the side. Once on the Pages tab, you can click on the New Page button to choose whether you want readers to be directed to a new page that you create, or to another Web address. Our Earnings tab is the new name for what used to be called Monetize. It’s just as easy to use, and we’ve got simple instructions to guide you through it. 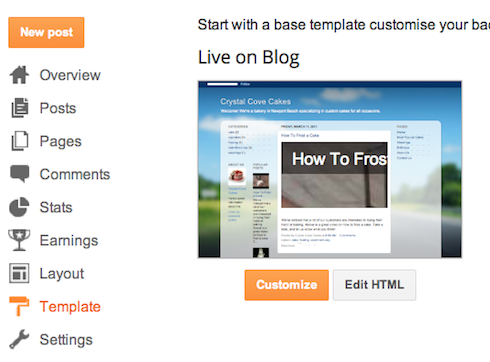 On the Template tab, you can either click on the orange Customize button to get started with our easy-to-use WYSIWYG (“What you see is what you get”) template designer, or choose one of our many default templates. If you’d like to edit the HTML of your blog, just click the gray Edit HTML button. On the Settings | Basics tab, you can click “Edit” on the relevant sections to modify your Permissions and Privacy settings.